The 6000 year history of the Jewish peoples, their faith and their culture is a subject of enormous importance, not only to the rapidly growing body of students of Jewish studies itself, but also to those working in the fields of Byzantine, eastern Christian, Islamic, Mediterranean and European history. 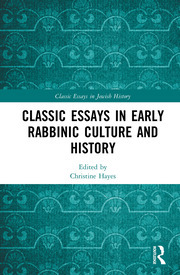 "Classic Essays in Jewish History" is a library reference collection that makes available the most important articles and research papers on the development of Jewish communities across Europe and the Middle East. By reprinting together in chronologically-themed volumes material from a widespread range of sources, many difficult to access, especially those drawn from sources that may never be digitized, this series constitutes a major new resource for libraries and scholars. The articles are selected not only for their current role in breaking new ground, but also for their place as seminal contributions to the formation of the field, and their utility in providing access to the subject for students and specialists in other fields. A number of articles not previously published in English will be specially translated for this series. 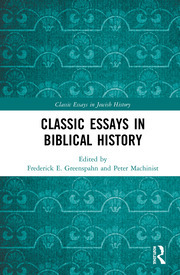 "Classic Essays in Jewish History" provides comprehensive coverage of its subject. Each volume in the series focuses on a particular time-period and is edited by an authority on that field.